Laura Smith is the curator of 'Virginia Woolf: an exhibition inspired by her writings' at Tate St Ives (2018). Interview by Rupert White. I understand you've been planning this show for several years. It's a show that I talked about at my interview for this job, five and a half years ago. When I was appointed, Martin (Clark) and I started thinking about it. Then about 3 years ago we worked out that 2018 would provide a good slot, because of the centenary of the Vote for Women, and we decided to open it this weekend and tour it throughout the year. So I've been thinking about it for 5 years, and working on it properly for 3. 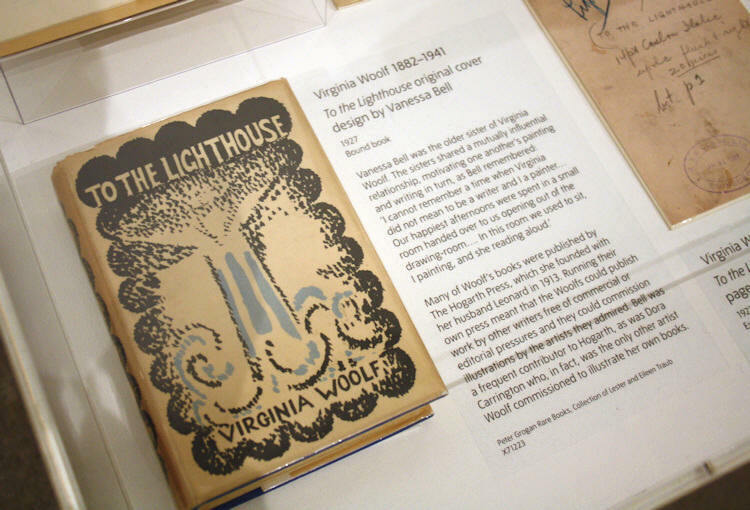 I went to New York to look at Virginia Woolf's archive, which is at the New York public library. Her archive was sold in the 80's when she was rather unfashionable. It was sold for very little. And I went to Smith College in Massachusetts which was one of the women-only colleges, when women still weren't allowed to go to Harvard or Yale. They have Vita Sackville-West's archive and Sylvia Plath's and a number of other writers. 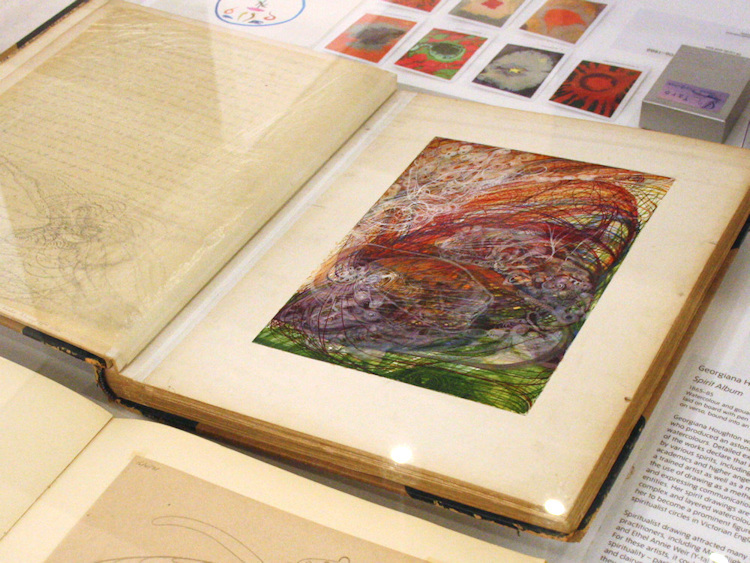 Then I went to L.A. to visit some of the artists who I knew are working with Woolf's legacy. Like Shana Lutker who made these incredible grates, Rosha Yaghmai who made this screen based on 'Street Haunting' by Woolf, and Eve Fowler who made this video work about writers in their studios. Coming to some of the other artists in the show, its nice to see these 'spirit drawings' behind us by Georgiana Houghton (above), which I notice are owned by the College of Psychic Studies. They're fantastic aren't they? Woolf was a pioneer of stream of consciousness writing. Just before she died she went to see the International Surrealist exhibition in 1936 in London, and she saw obvious parallels between automatic writing and automatic drawing, and her own experiments with stream of consciousness. She got really interested in the Surrealists for that reason and also because they were pacifists and anti-fascists as she was. She'd have been familiar with Freud. Lytton Strachey's brother translated his books into English. Yes, but she never met Freud. There's a brilliant story in her biography. She wrote to him and said "you should come and psychoanalyse me I am definitely the most interesting person I know". And all he did in reply was send her a narcissus plant, with no words. But the link between Surrealism and her was an interesting one. Houghton's drawings precede that, and they also seem to tap into the unconscious or sub-conscious. Another pre-war artist that is again perhaps not so well known is Gluck. Has she been exhibited recently? There's a small solo show in Brighton where she lived for most of her life, which might have just closed. Did she have links to Cornwall? She was in Lamorna for a long time. There is a letter here from her to Ithell Colquhoun. She was pretty fierce. She used to come into St Ives in a horse and cart, and stride about in a red floor-length cape! I think I've seen her double portrait before (below). Is it in the Tate Collection? No, it's in a private collection in Turkey, but it featured in a BBC4 documentary. 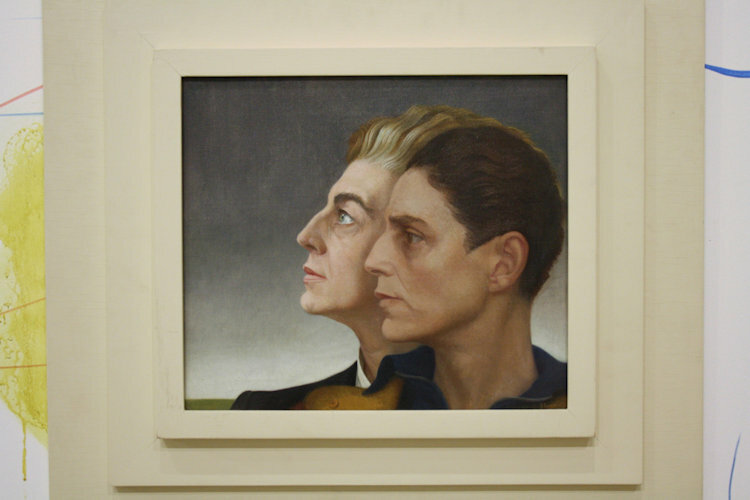 The double portrait is her and her girlfriend, Nesta. The small one next to it is of another girlfriend in London, Craig. Their families were very disapproving of their relationship, so they ran away to Lamorna together. Although this is a all-female show, there aren't really any of the yBa-generation artists. Is there a reason for this? I started with this backbone of artists who had a direct connection with Woolf, or who say they're directly inspired by her, and then to broaden the conversation I looked for other artists that shared similar approaches. That yBa generation were doing something very different. Their whole methodology was different. There are some important feminist artists in the show, like Mary Kelly and Louise Bourgeois, and there's Penny Slinger and Linder and Joan Jonas and Geta Bratescu. For a while there was a Sarah Lucas. One of her chairs. It went in and out, and in and out, but in the end it was just dominating that first room too much. Rebecca (Warren) does the yBa thing more quietly, which is why I've been a big fan. She does it more sensitively. Virginia Woolf herself wasn't exactly a strident, or militant, feminist was she? She never called herself a feminist because that term wasn't really used then, but this writing from Three Guineas is strident. Its fierce! "Let the daughters of educated men dance around the fire". And in the archive case there were lots of her letters between her and the suffragettes, which shows how connected she was with them. Weren't her parents, the Stephens, friendly with Wolstenholme? Elizabeth Wolstenholme set up one of the most violent and extreme suffrage leagues in Manchester. Her brother Joseph used to holiday with the Stephens at Talland House in St Ives in the summer. Talland House was important to Virginia Woolf for lots of reasons, but it was also the first place that she encountered feminism. She certainly loved her sister's (Vanessa Bell) work. There are some letters in the archive cases, about this. She only let Vanessa and Dora (Carrington) illustrate her books. But for the Hogarth Press she employed lots of artists, so she was quite involved in artistic circles. Who in particular did she rely on in this respect? The whole Bloomsbury group. Roger Fry did a lot. Dorothy Brett. Lots of the Omega artists. But for her own books it was Vanessa (above) and Dora. She did write a foreword for a catalogue for Vanessa in which talks about how incredible it is that a woman is having a solo show in Mayfair, and how important Vanessa is. Vanessa said in one of the letters 'I'm worried that people will think you're being sycophantic, because you only write about art when you write about me, so I think you should write a book on Walter Sickert'. So she did but it's almost an essay. It's very short. Yes. And a biography of Elizabeth Browning's dog called Flush. In her letters she talks about loads of art she's seen. But I think she thought art was more Vanessa's domain, so she didn't write about it. And they were really competitive. There's a letter from Vanessa where she says "thank God Virginia wanted to be a writer and I wanted to be a painter otherwise we might have killed each other. It was one less thing for us to compete over". Vanessa was less troubled in her lifetime than Virginia, but Virginia has ended up being better known and more celebrated. See 'exhibitions' for more installation views of the show. 'Virginia Woolf' continues until 29/4/18.